Dexter Russell S2896PCP Traditional 10-1/2 Carver Fork"
The Pampered Chef Cheese Spreader Knife Set Of 3! This beautiful silver Mis Quince cake knife and server set has an elegant acrylic crystal handle design. The cake knife and server sets are made with durable stainless steel and are perfect for Quinceaneras, Sweet 15, Mis Quince Anos celebrations. This beautiful golden Nuestra Boda cake knife and server set has an elegant acrylic crystal handle design. 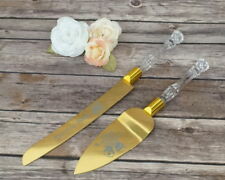 Gold Nuestra Boda Cake Knife And Server Set Acrylic Handle. 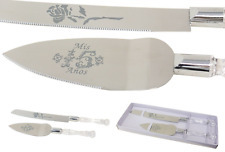 -Cake server features "Nuestra Boda" embossing and cake knife features Wedding Bell design. 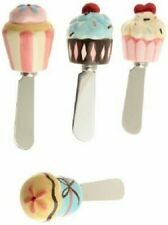 DII Cupcake Spreaders. DII Ceramic Cupcake / Stainless Steel Spreaders. Our spreaders would be perfect for any family get togethers, parties, showers or …. just because. For all you cupcake lovers, we brought in. 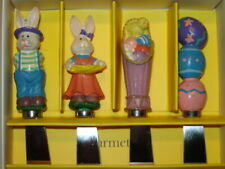 A box of 4 Easter cheese spreaders, with stainless steel blades. Pampered Chef. 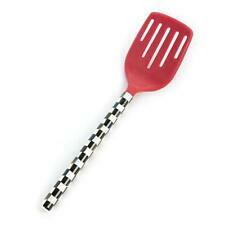 Mini Serving Spatula. 3 1/2" blade, stainless steel. 11" x 4 3/8". Fine Print. The box does show slight signs of wear due to storage. These will not last long! Hard Cheese Knife 7.4in. Crumbly Cheese Knife 6.7in. Soft Cheese Spreader 7.4in. Cheese Fork 6.7in. MIKASA STANTON CAKE SERVING SET. KNIFE IS 12.5" IN LENGTH, SERVER IS 11.5" IN LENGTH. 18/10 STAINLESS STEEL. 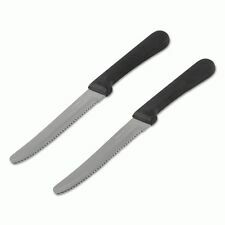 Slicer is rust-resistant & dishwasher-safe - Use it for serving cake, quiche, lasagna or pizza too! Stainless steel pie cutter lets you cut pie slices & serve them without damaging delicate pastry. Smooth-gloss blade & brushed steel handle make this pie knife a nice addition to your fine flatware. Great as appetizer plates, or as small trays to be used with dip bowls. 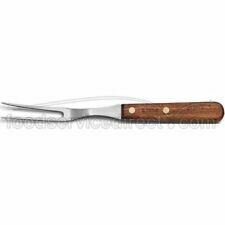 These butter knives feature stainless steel blades, brass rivets and smooth easy to grip wood handles. Wide Stainless Steel Spread Knives. We also provide expedited service at a low price. 3 Piece Deluxe Serving Set Royal Prestige. 1 Serving Spoon. 1 Pierced Serving Spoon. Yamazaki Japan Gone Fishing Set of 3 Stainless Steel Pie & Cake Server, Solid Serving Spoon & Fork. Marked: Yamazaki Japan. 1 Solid Serving Spoon (8 7/8"). 1 Pie & Cake Server (9 3/4"). Cutci Cheese Knife . Condition is Used. Shipped with USPS First Class Package. Norpro Stainless Steel & White Porcelain Cheese Spreader . Our spreader knife could be used for butter, cheese, peanut butter, hors d’oeuvres and more. It’s compact, sturdy, strong handle and serrated edge would be a great fit for almost any purpose. 3 PIECE CHILD'S SET OF STAINLESS STEEL UTENSILS - SAFRANO PATTERN #HF51. Salad Spoon & Fork Server Set. These will look great at your next outdoor BBQ or covered dish dinner. Resin Handles. Stainless Steel. Inspired by the beauty of the sea, the MADHOUSE Opaque White Coral Salad Servers are designed to mimic delicate coral branches. Not intended for use in the microwave. We will try our best to rectify it. TOWLE LIVING PIXIE PASTRY SERVING SET - SWIRL AT END OF HANDLE. KNIFE IS 13" IN LENGTH, SERVER IS 11" IN LENGTH. HANDMADE 18/10 STAINLESS STEEL. Tasting parties will shine when served with their Rock Mini Plastic Spoon. Perfect for appetizers and small bites, these nature inspired mini spoons will bring elegance to your table. Box of 20 gold spoons. Hand Made Set of 4 African Wood Soup Spoons with Decorative Beading around the Handles. Hand Carved to a smooth finish. Color variations are due to lighting and screen settings. Used only for display. Natural shells are paired with polished steel in our ocean-inspired Seashell Collection. POTTERY BARN SEA SHELL SERVERING SET. Serving Spoon: 2.5" wide x 11.75" long. Features a natural shell handle. Mossy Oak Two Piece 18/0 Stainless Steel Salad Serving Set. HAS A MOOSE ON ONE HANDLE AND A WHTETAIL DEER ON ONE HANDLE. Set includes a serving fork and serving spoon- APPROX 9" LONG. Premium stainless steel. HOW SWEET IT IS! Would make a great gift! Condition is New. Great for Seafood, shellfish, crab, lobster, cheese, fruit, olives, etc. Seafood Forks. Steel forks have tines on one end and a flat pick on the other. Vintage Carved Bone Cocktail Fork and Spoon Sets. Condition is Used. Shipped with USPS First Class Package. Blade Material: Damascus steel. Blade material: The blade is made of Damascus steel;the 10Cr15CoMoV high carbon steel is selected for the steel core whose hardness is stable at 60 ± 2HRC, showing its excellence in high sharpness and durability;. LAGUOILE INOX FRANCE 2-PC WOOD HANDLE SALAD SERVERS SERVING SET "BEE"
CHEESE ~ JAM ~ BUTTER SPREADERS. Set of 3 Stamped Knives. With cute and creative design, give the perfect accent to any table. They are perfect for gift baskets or simply for your own personal use! Provide decorative theme and variety to your table. We have so many patterns for you to choose from, come to pick them for home entertaining! Useful for spreads, dips, and soft cheeses. The stainless steel blades and unique hand painted handles are both charming and practical. Features & details Size: 4 3/4" L Material: Hand Painted Resin, Stainless Steel Care & Clean: Hand Wash Only Includes: 4-PC The unique Teapot-inspired design. It can be an accessory to and beautiful dinnerware that you have. Cutco White Pearl 3 Piece Set includes a slotted spoon (1713), basting spoon (1712) and a ladle (1715). Condition is used with some scratches to the stainless steel. Any questions? Please ask! The large oblong pads display beautiful chasing and cut-work producing a design of a border of flowers surrounding the classic basket of flowers. The handles also have floral/scrolling designs. 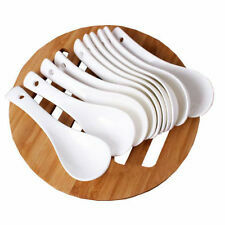 Set of 6 knives or mini spreaders and 6 mini forks. Gold color with wood detailing. 4 Pieces Set Cheese Knives - Stainless Steel Cheese Slicer! Includes 1 x Semi Heart Knife for Spreading Cheese; 2 x Rectangular Shapes for Slicing and Spreading; 1 x Prong Fork for Serving. ♫ Great to hold, cut, break, slice and shave any type of cheeses. NEW Michael Aram Ocean Coral Serving Set- In Box! GORGEOUS Tropical/Ocean/Sea. Condition is New. Shipped with USPS Priority Mail. Mid Century set of Stainless Steel and Wood Salad Servers marked WMF Cromagan. And do Everything in my Power to ensure they arrive safely. 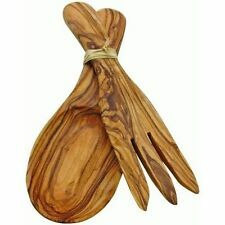 Set of 4 cheese/ pate spreaders with pewter handles. Spreaders are 5” long and have different fruits embossed on both sides of handles with stainless steel blades. EUC & from nonsmoking home. Ensure sanitary dispensing with individually wrapped utensil combos. • Wrapped for sanitary dispensing. Excluded are Alaska, Hawaii, Puerto Rico, APO/FPO, PO Boxes and International locations. Up for sale is a set of 6 owl cocktail appetizer forks in an owl holder. I listed as used however I don't think that they are. Still in box. SILVER PLATED OWL COCKTAIL FORKS PICKS SET OF 6 WITH HOLDER. HIC's Sugar Tong with a classic rose design easily picks up and delivers sugar cubes for sweetening tea, coffee, cereal, fruit, desserts and more. It's spring action makes it easy to use. Simply squeeze the Sugar Tong to pick up the cube, release where needed and enjoy. Perfect for cubes made of all types of sugar, like granulated sugar, sugar in the raw, turbinado sugar, brown sugar, sugar substitutes, even homemade sugar cubes and decorated sugar cubes. A helpful addition to flatware and tea accessories, HIC's stainless steel Sugar Tong is up to the task for everyday dining, holiday meals, parties, even outdoor entertaining. A tradition since 1965, HIC Serveware is made from Japanese gold-plated stainless steel and is dishwasher safe for easy cleanup. "NACHO ORDINARY SALSA". Includes 3 -6" Spoons;. Be sure to add us to yourfavorites list ! Item#: 4051018. Joe de Vivre "Spread It On" Four spreaders for cheese or other spreads. Very cute for use at parties or as a hostess gift.